I got the new iOS7 and iPhone 5s at the same time so I don’t know which one is causing this but my sisters share their google calendars with me and I have them on my phone but they are unchecked/hidden right now, however, I still get notifications that are supposed to be theirs! How do I turn off shared calendar alerts? The “Shared Calendar Alerts” button doesn’t do the trick. I fear I have to delete their calendars from my phone along with my ‘other’ calendars, like my running schedule that doesn’t need to remind me that I need to run. Other factor that changed: I had to go to installing my calendar/email via the google option instead of through exchange with the new iPhone. Like a spring cleaning, where you purge the items in your closet or attic that have been there for more than two years or are made of corduroy and flare at the bottom – I have not done this, I still have shirts that were acquired in high school – I went through my iPhone and deleted apps that were collecting virtual dust, hogging precious potential photo-taking space and ones that only saw the light of the screen when they required an update. 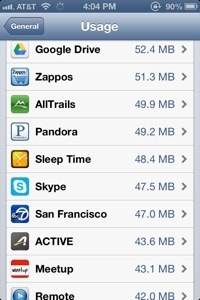 One such app was taking up 205 GB, then upon “cleaning out” records in the app, it GREW to 216 GB. WTF!? 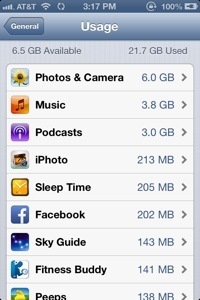 The troublesome app has been deleted and started over with a fresh copy at a tiny 48.4 MB. Because I actually use this one 🙂 and just like a closet after spring cleaning, the phone doesn’t feel any lighter but I certainly will enjoy the absence of apps that are not used notifying me to update them.